Okie dokie, artichokie, it's Friday (woo!) and as promised, here is part two of my Life in Color collection review. 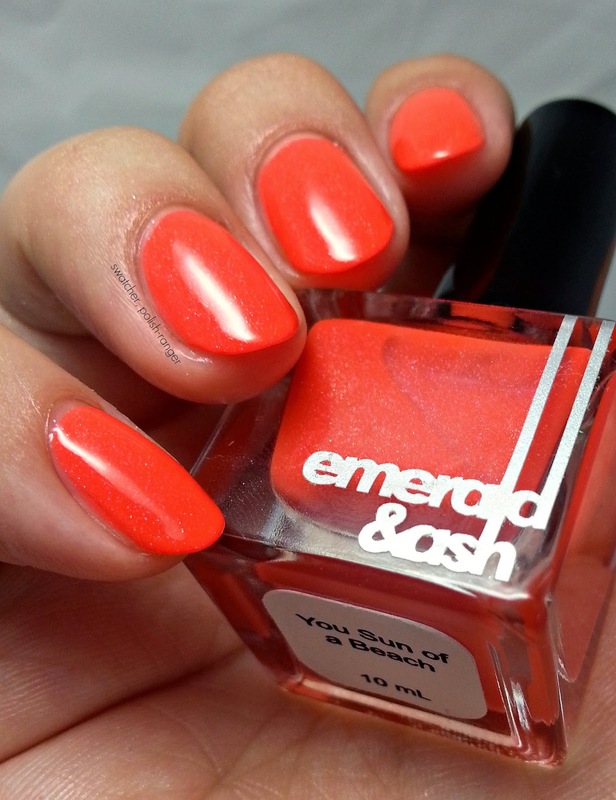 Like part one, this post features three gorgeous shades (and a bonus link to a 7th!) from Emerald & Ash. Let's get down to business. As per usual, the descriptions come directly from the maker. The snozzberries taste like...blurpurple jelly. Wait no, that can’t be right. 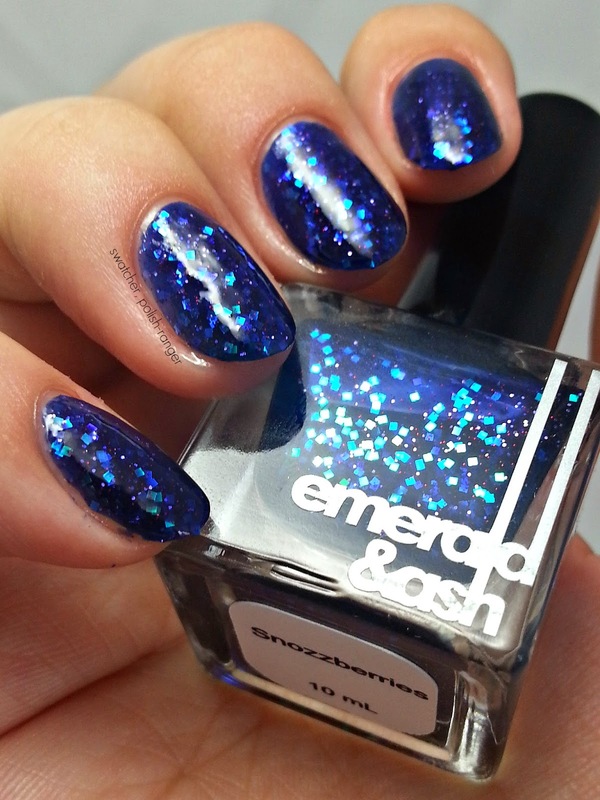 Anywho, our version of Snozzberries is a purple jelly that is filled with color shifting square glitter and some purple and red holo micro glitters. Goes on in two to three coats depending on your application. Can also be put over a base color if that tickles your fancy. A top coat is recommended to give the polish a smooth look. Charlie & The Chocolate Factory is one of my favourite movies EVER and I tend to use the phrase this polish is inspired by quite often, so how could I help but love it? Plus, it's blurple which I'm fairly certain is the best colour name ever (grellow, you don't hold a candle!). The formula on this was fantastic and the perfect amount of glitter applied to the nail with every stroke (how amazing is the tiny red glitter?). Shown here is two coats and one coat of Gelous. I love sunshowers. The sun glittering off the rain drops just makes it seem so much more magical. The flakies in this polish are so pretty - they glint and glimmer when they hit the sun and the grey base is so delicate and elegant. Shown here is two coats and one coat of top coat. Once upon a time we found an ottoman that had beautiful bright colors and it needed to come home with us. It also needed to be made into a polish. After many trials and errors it decided to be a fun, festive glitter topper. Because it said so. And so, Confusion with a K was born. A glitter topper full of neon pink, neon green, metallic navy blue, grey and white glitters of all sizes. It wants to go on top of ALL of your polishes and maybe even be sandwiched between them as well. 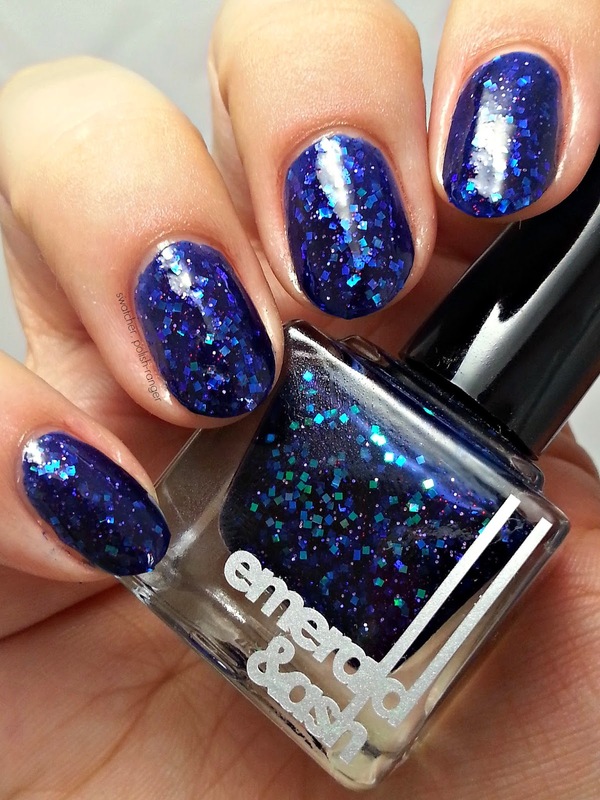 You’re good to go with one to two coats, depending on how glitter-hungry you are! 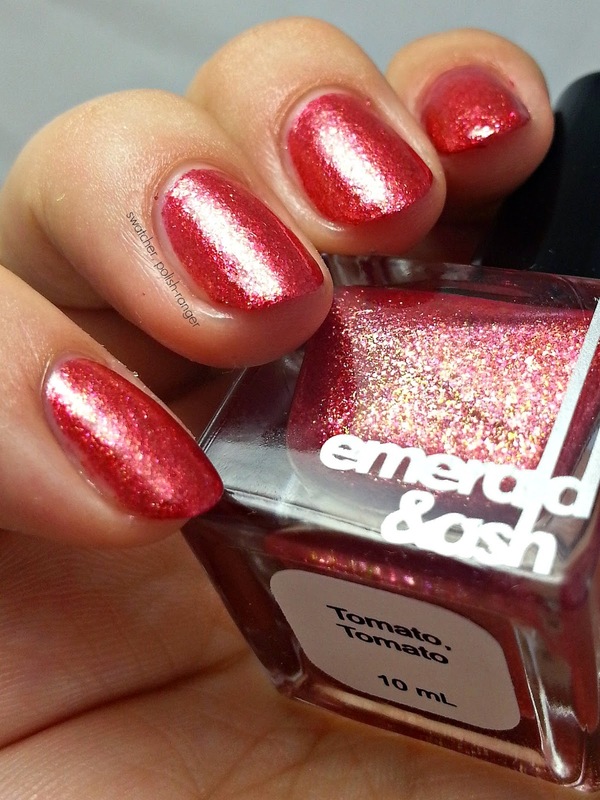 This glitter topper is where Emerald & Ash's thicker base really comes in handy. I did not have to fish for a single piece of glitter! See those large pink hexes? Yep, they just willingly came out on the brush. Glitter application like this makes my life so much easier and less frustrating. Plus, these colours are amazing and perfect and I love them. :) Shown here is one coat over China Glaze Def Defying and one coat of Gelous. Bonus link: Ashley and I were chatting one day and she mentioned that she thought my custom, Stubble Jumper, would be the perfect addition to a new collection she was planning. Of course, I was flattered and said yes right away. The thought that people like something I had a hand in creating just tickles me. Spread the prairie love, people! I was also sent a 3ml bottle of the July oil of the month, Fresh Cut Grass, which is a scent I already love. I had kind of... badgered? nicely? Ashley about a grass scent. :) And you already know how I feel about their cuticle oils. 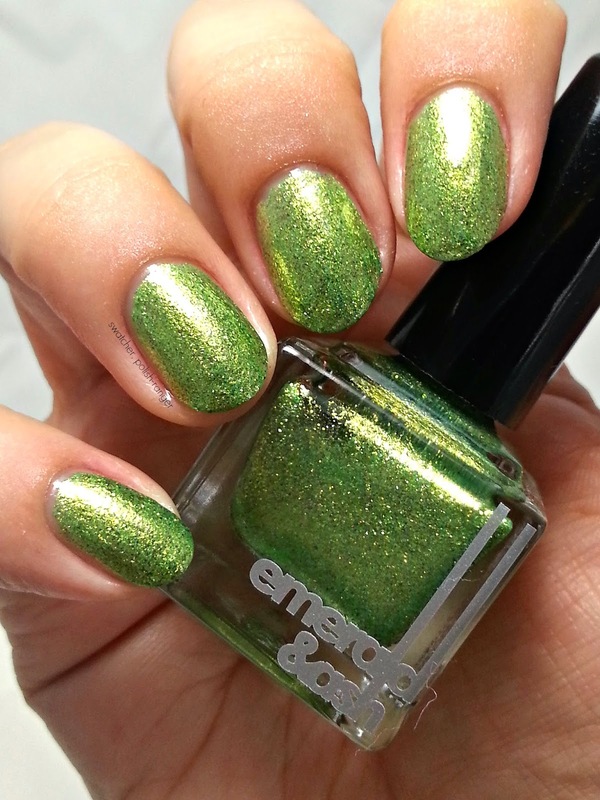 All Emerald & Ash lacquers are 5-Free and are not tested on animals. 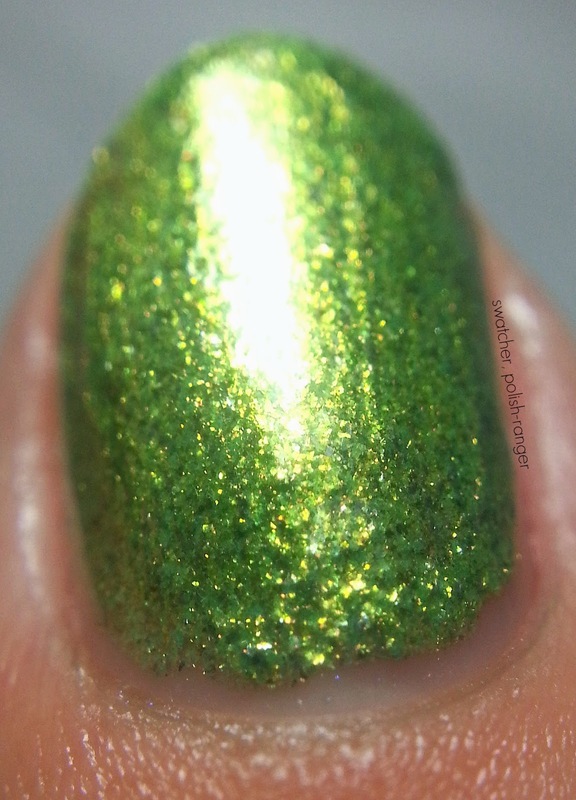 The people who make the polish are always better at describing it than I am so, as usual, polish descriptions are taken directly from Emerald & Ash. Who doesn’t like magic bananas!? We sure love them around here, especially when used as an exclamation! It’s a phrase used so much around here that we had to make this yellow and green all flakie polish that has a hint of gun metal flakies - you know...for those bruises that pop up on your bananas, no matter how magical they are. This can easily be a full coverage flakie in 2-3 coats, but you can always uses it as a topper if that tickles your fancy. Now is where I admit to being an incompetent nail blogger. I need practice applying flakie polish. Polish with flakies in it? Sure, I've worn those. Pure flakies? 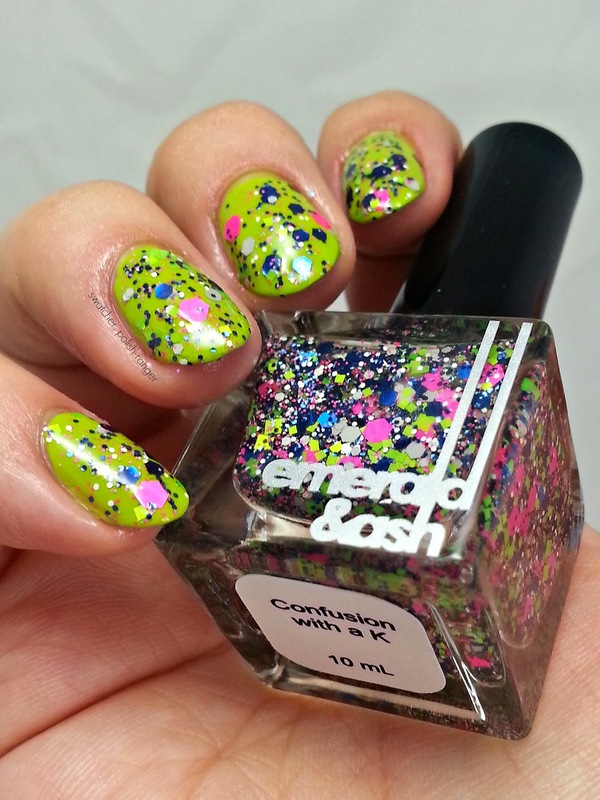 A polish literally packed to the brim with flakies? Nope. I think I rushed my coats which resulted in some dragging and bunching at the tips (you can particularly see this on my index finger). All you need is some patience and you will be handsomely rewarded. 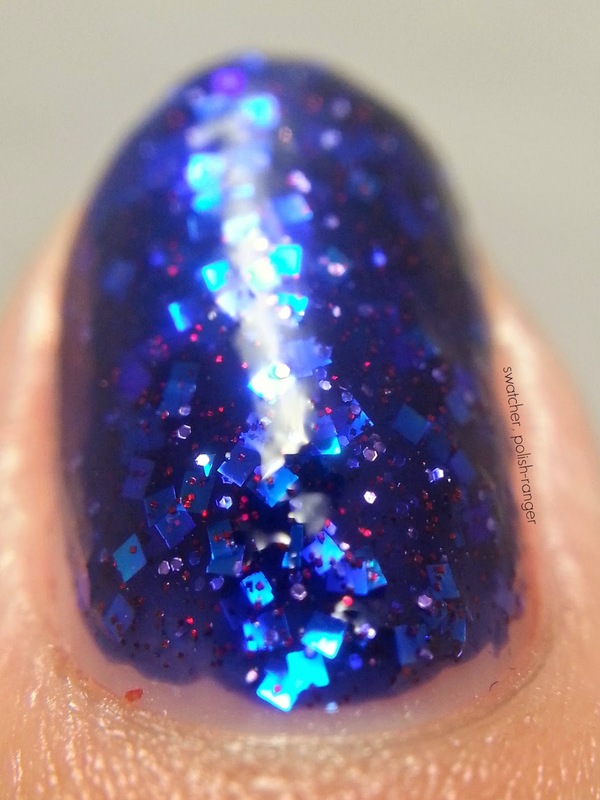 The flakies in this are so pretty and the final result is simple yet complex. Shown here is two coats and one coat of top coat. 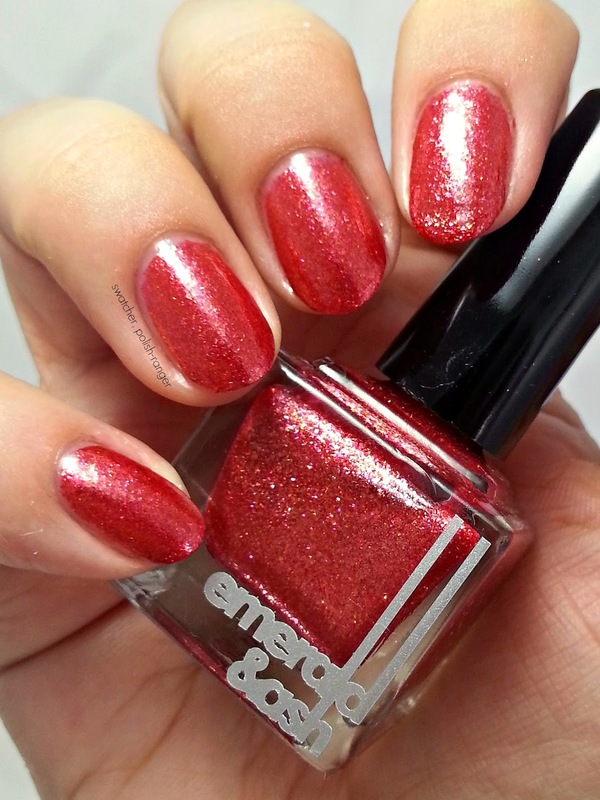 You say tomato and I say...this tomato based polish looks amazing with flakies that throw off a red and gold shimmer while trapped in a sheer red jelly base. Can be worn to full coverage in 2-3 coats, depending on your application or it can be placed over your favorite reds to add a quick punch of fun! Another polish that highlights how poorly I applied it. 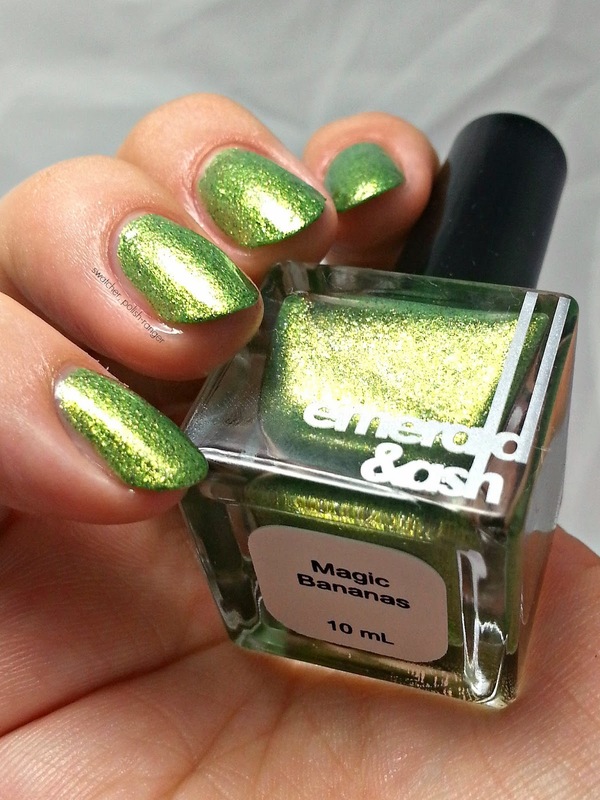 :/ As with Magic Bananas, this flakie packed polish just requires an extra bit of patience with the application. You know, if asked, I will always say that red is never my go to colour and yet, it plays so nicely with my skin tone. This one in particular is gorgeous! The gold with the red not only plays perfectly off the tomato theme, but it's a great fall transition colour. Again, I used two coats and one coat of top coat. 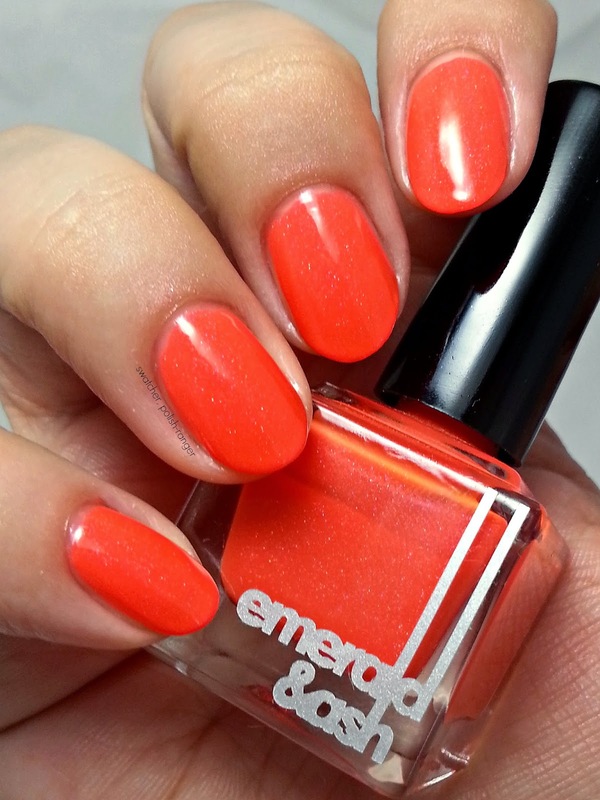 An eye-searing bright neon leaning coral crelly that hits you with a dose of scattered holo, just in case you already haven’t been blinded. Due to the nature of neon pigments this will dry to a semi-matte look. Leave it as is or gloss it up with a top coat, your choice! You can always layer it over a base coat of white polish to make the color pop even more! Without a base color you can get full coverage in 2-3 coats. Good lord, I love this polish. 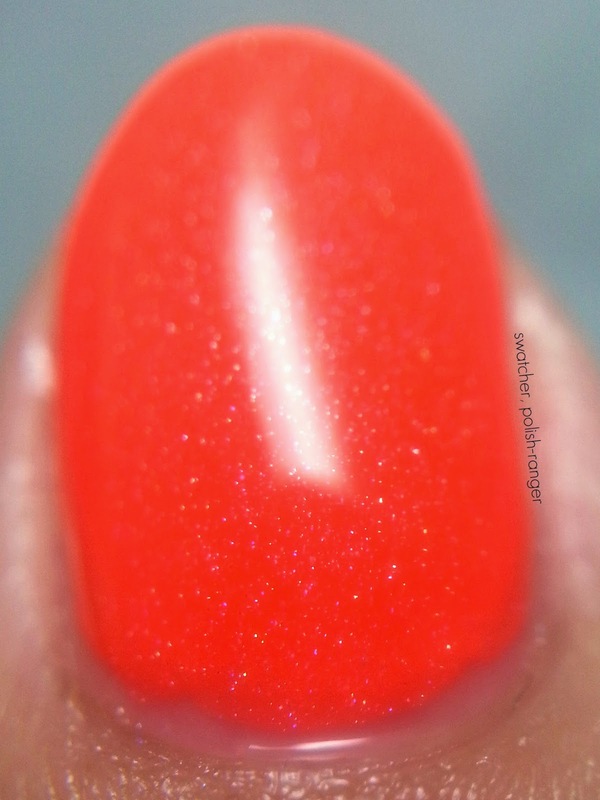 Neon coral with scattered holo?! Be still my heart. The formula on this one was amazing! With careful application I only needed two coats and one coat of top coat for this stunner. This is one of my favourites from the entire collection! So, there are the first three. What do you think so far? Definitely full of colour, right? Stay tuned - I will have the final three up later this week. Exciting news, guys! Tia (of Iced Lacquer) and I are teaming up to create a podcast! 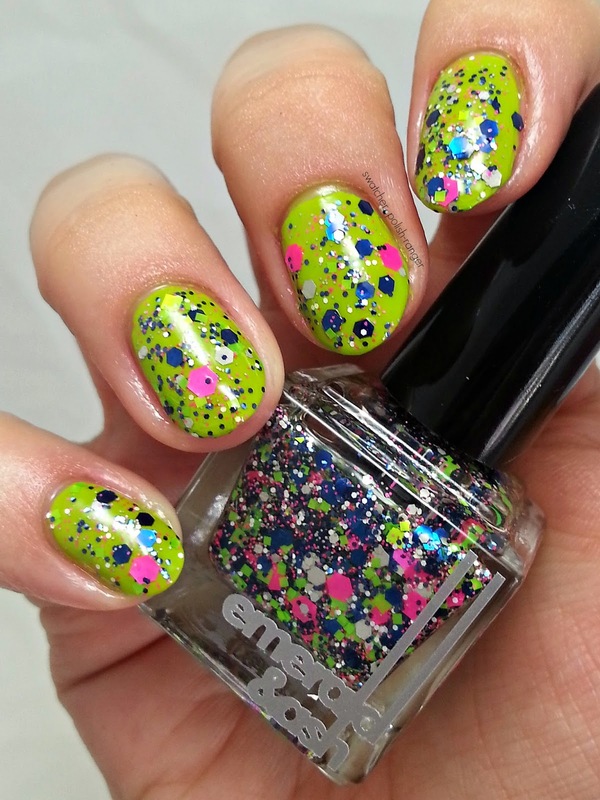 Nail Newscast was Tia's brainchild and is something she's been thinking about for a while. She and I connected over our love of WingDust polish and she was kind enough to approach me about being a co-host! Awesome, right?! I have to admit, in the very beginning I was *thisclose* to saying no. "I'm awkward and strange and try too hard to be funny," I thought. "My voice sounds weird in recordings," I thought. And then I said to myself, "self, WTF are you thinking? Say yes! It will be awesome and fun and what's the worst that could happen? So you push yourself out of your comfort zone. Isn't that a good thing?" So, yes it was. Tia and I have had fun brainstorming and Skyping and coming up with lists of people we'd love to interview. We've tried to get over our inherent introvert and just put out a quality product. I hope you are as excited about this as we are and I sincerely hope that you tune in every Wednesday for the latest in the nail polish world. We are Nail Newscast. We are a team of nail polish bloggers who wanted to create a podcast all about nail polish. Our team currently includes Tia from Iced Lacquer and Courtney from Swatcher, Polish-Ranger. 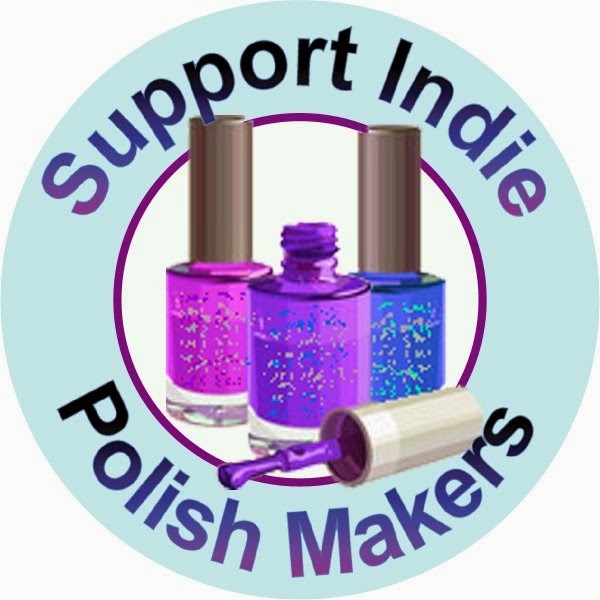 The Nail Newscast podcast is all about upcoming nail polish collections, sales, trends, interviews with indie polish makers and other bloggers, and general nail polish news. Why did we make this? A nail polish podcast is definitely something that doesn't exist yet. We felt like there is definitely a lot of great content out there that people are interested in, we're just putting it in a new format that's easy to listen to! As of right now we are planning to release our first episode on Wednesday, August 6th. For now we'll be hosting each episode on our Soundcloud account. We will also have an embedded player for each episode on this blog as well as an RSS feed you can subscribe to. Feel free to follow us on Facebook, Twitter, and Instagram, and Bloglovin for additional content and updates!